Ah yes, nothing disrupts writing quite so completely as death. I’ve been making my way along since Ann’s death, good most days, a weepy mess on others, with no warning and no apparent trigger for the tears. But that’s how grief goes, unpredictably and in waves. And somehow any grief is every grief, so sadness over one loss brings back sadness over another. Lately I’ve been acutely missing my old friend James. He was as different from Ann as any two people could be, in life and death. James was an irrepressible enthusiast who couldn’t wait to tell you a new joke, or give you a taste of the latest in a never-ending series of new foods. He died at 84, with a soup on the stove and a cookbook on the table, from a heart attack so massive that he may not have had time to register what was happening. I’d been missing him even before I found the baby artichokes in the grocery store. But standing at the chopping block, trimming away the outer leaves, I felt again that particular ache of wanting to see someone you love, and knowing that you never will again. 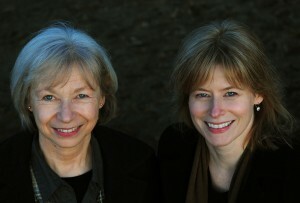 Forty years ago, in San Francisco, we were shopping for supper and James found some baby artichokes in the market. I’d never seen them before. He erupted into effusions. We bought a very generous amount. Back at the house we were staying in, he showed me how to break off the outer leaves, trim away the green on the stem end, and immediately rub the ends on a cut lemon. Next step: slice off any prickly ends of leaves and rub the ends on a cut lemon. Then cut them in half, and rub the halves on a cut lemon. 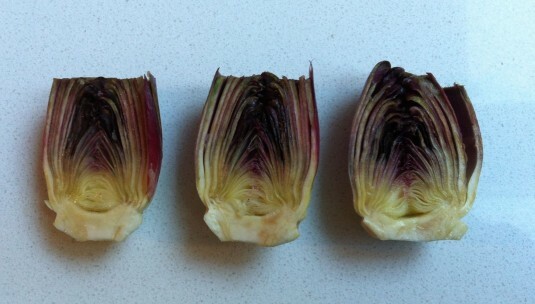 You can’t possibly overestimate how quickly a cut artichoke left open to the air turns brown. Then he warmed a bit of olive oil in a heavy frying pan, put the artichokes in, cut side down, cooked them until they browned, then turned them over, ground on salt and pepper, and squeezed the juices of the cut lemon over top. He put a lid on the pan and cooked them until they were tender and easily pierced by a paring knife, about 10 minutes. We ate them whole, with good bread and wine, all by themselves. Oh my. I’ve cooked baby artichokes many times since. In fact, I buy them whenever I run across good-looking ones, firm and fresh. The purple ones, by the way, while exceedingly nice to look at, don’t offer any other benefit over their plain green cousins, and seem to take longer to cook. 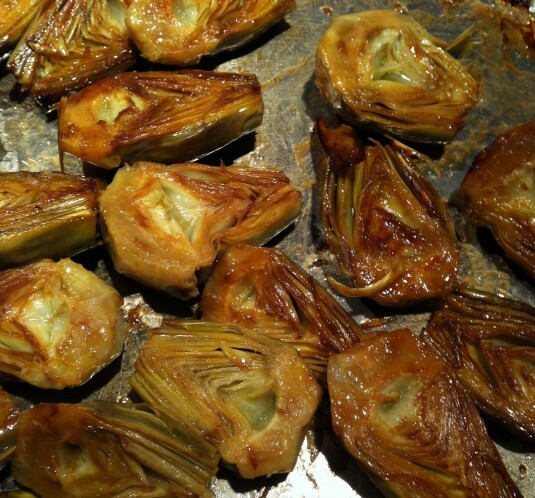 Last week, I bought artichokes, thinking I’d make them as a side dish for Friday’s supper. But by suppertime I was in a hurry, so I didn’t cook them. On Saturday, we bought spot prawns, the first of the season – just eight, at a somewhat astronomical price from our neighborhood health food mega chain. Pasta would turn the prawns into dinner, so pasta it was, with baby artichokes, spot prawns and goat cheese. Alan kindly twisted the heads off the prawns for me. But the livelier they are, the harder it is for me to separate the heads from the tails. I’m a hypocrite: I love to eat them as long as someone else will spare me the horror of killing them. I put the pasta water on once the artichokes had started cooking, then sliced some onions very thin and put them in a second pan to cook slowly in olive oil. The prawns joined the onions when the pasta was almost cooked, and took only two minutes before they turned a bright pink. I used the whole grain spaghetti that Barilla makes, but any long thin pasta would do. A bit of goat cheese and parsley on top, and there it was: an impromptu taste of spring. We talked about James over dinner – Alan knew him too – our delightful, prickly, always entertaining friend. It’s been five years since he died. In my experience, grief never goes away, but it gets softer over time, and in the end, you almost welcome the ache, because of the memories that come with it. In the spirit of James, here’s a recipe for two that you’re encouraged to modify. 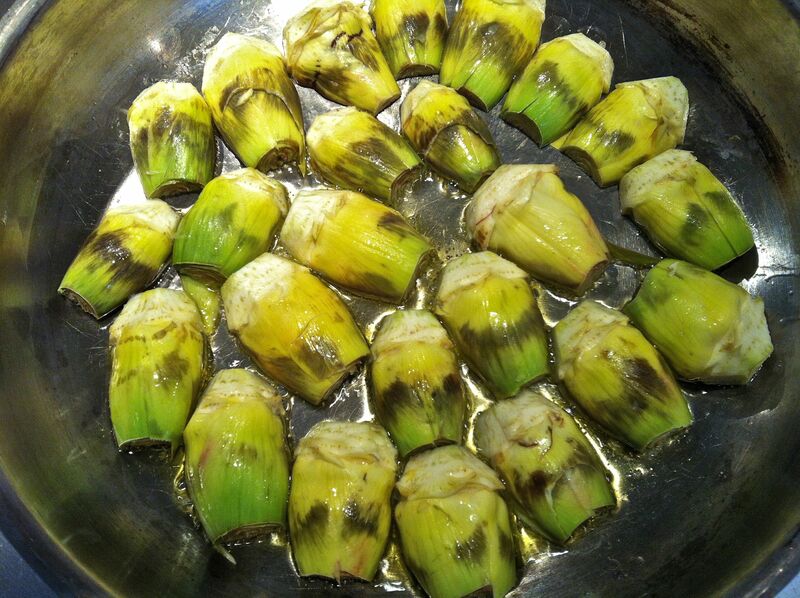 Trim the artichokes and seal the cut ends as you go by rubbing them into a cut lemon. Heat a tablespoon or more olive oil in a heavy frypan. Place the artichokes fact down in the pan. Cook them on medium heat until they brown. Once the artichokes are cooking, put the pasta water on. In a second frypan, heat a tablespoon of olive oil and add the onions. Cook them slowly, stirring often, until they are soft and beginning to brown. Once the artichokes have browned, turn them over, sprinkle with salt and pepper, and squeeze on the remainder of your lemon. If your lemon is not very juicy, add the juice of the second lemon. Cover the pan and cook over low heat until the artichokes are tender and easily pierced by the point of a paring knife, about 10 minutes. Check the pan often. If it's too dry, add a few tablespoons of chicken stock or water. Put the pasta in when the water is boiling. 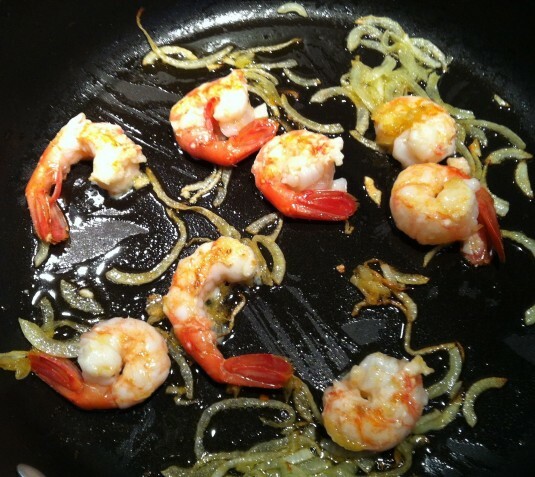 When the onions are cooked, bring the heat to high and add the spot prawns. Cook for a minute on each side, just until they turn pink. Turn off the heat and add the cooked prawns and onions to the cooked artichokes. Drain the pasta, add to the prawns. Then put the pasta into a serving dish, top with crumbled goat cheese and sprinkle on parsley. I like cooking the big ‘chokes, cut in half but not cleaned. I let them drain, cool down, then cut out the choke. I then put salt and oil on and broil them. A sprinkle of parmasen is all they need. Great as an appetizer or a side dish. I was grieving for my mom when the US invaded Iraq. I grieved for my home country as well as for my mother. It all gets better, but it will always come back, just more peacefully. Great to hear from you! My own method for grilling the big guys is much more complicated. I’ll have to try yours while they’re still around. Very sweet … I think as time goes by the MEMORIES of a lost friend/family become more precious … at first they are heartvwrenching but as time goes by, more vivid and bittersweet. James sounds like he was quite the man in the kitchen!